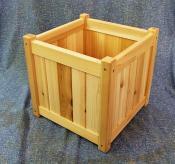 The two smaller planters easily fit inside the 20" square planter for easy storage. 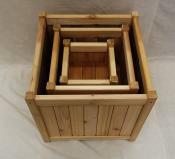 The square boxes are available in three sizes: 10, 15 and 20 inches. The rectangular boxes are 20 and 30 inches wide. Both are 10" deep and 10" high. 10-inch square: $25 unstained; $30 stained. 15-inch square: $45 unstained; $50 stained. 20-inch square: $65 unstained; $75 stained. 20-inch rectangle: $45 unstained; $50 stained. 30-inch rectangle: $55 unstained; $65 stained. 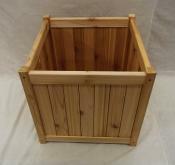 More choices: Check out our cute cedar flower pot planters. And check out our Bear and Moose birdhouses. They've got their own personality.